I have never had any desire to protest – not anywhere for any cause. In fact, I really cannot imagine myself ever protesting actively. Perhaps this is just egocentric on my part, but I have always thought that my presence – both mind and body – could be put to so much better use than just adding myself to the masses shouting on the top of my lungs. Needless to say, I am not a crowd person. This doesn’t mean that I haven’t experienced protests as a spectator and appreciated them from an academic standpoint. The first protest I ever stumbled upon was in Barcelona. Normally, I tried to avoid protests especially when I knew that they were going on. However, in this instance, my parents and grandmother were visiting me and I wanted to show them the best sights during their short stay. They found the protest in the main Plaza Cataluña fascinating and it became a translation exercise for me – my Catalan skills put to the test! My second protest was one that I actively chose to attend. While attending Democratic National Convention in 2012 events as a representative from my college, I decided to spend one of the afternoons watching an Occupy Protest Parade. I found myself standing next to a CNN team the entire day and struck up a sort of friendship with the cameraman (who was a part of the team in Baghdad which brought CNN to global fame during the First Gulf War) which now involves Facebook and Christmas card correspondence. Perhaps my lack of willingness to protest is just a sign of my complacency in the United States. Perhaps I am jaded. But, to be honest, I don’t really feel as if I could make much of a difference through protests and activism. After having encountered people from other countries, I wonder if I would feel differently if I was not a U.S. citizen. 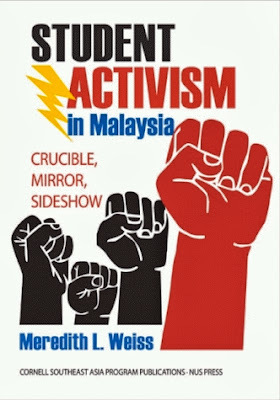 It is with this background that I chose to read Student Activism in Malaysia: Crucible, Mirror, Sideshow written by Meredith L. Weiss and published in 2011 by Cornell University’s Southeast Asia Program Publications. Although it was home to many linguistic and ethnic groups, Malaysia experienced a sort of unification following British colonial control – a process which began in the 1700s. The country was subject to Japan imperialism during World War II and gained its own independence in 1957. It is important to recognize the importance of this colonization in regard to education and the university system, especially when taking into account the ethnic diversity – Malay making up a little more than 50% of the population; Chinese making up nearly 25% of the population; Indian Tamil making up 7% of the population, and other ethnic groups (including indigenous people to the region) making up the rest. I think that it is worth mentioning that although Islam is the official language of the country (and is celebrated in the country’s flag design), it only claims about 60% of the population at its adherents. Freedom of religion is permitted and accepted. Likewise, it is worth noting that the country’s official language is Malay as established in the 1957 Constitution. The author states that, “The story of student activism in Malaysia weaves through the narrative of a young state engaged in its own sociopolitical development. The university in Malaysia dates only to 1949, when King Edward II College of Medicine (established 1905) and Raffles College (established 1929) merged.” (page 17) I thought this was a fascinating lens by which to read the book and seeing how higher education changed and evolved as the country gained its independence and came into its own.